What happens when Asia's 'water tower' dries up? LIJIANG, China -- After photographing Black Dragon Lake here for eight years, He Jiaxin knows of more places where he can get the lake to mirror the majesty of its surrounding mountains than anyone else. But this year, he has a problem: The lake has disappeared. Since its springs dried up last year, no water has flowed into Black Dragon Lake for more than 400 days. At the same time, hot weather caused a high evaporation rate, turning a large part of the lake into a play yard for children. Black Dragon Lake had plenty of water in 2008, before the record drought. Photo courtesy of Gad Ariel. "I've never seen such a dry-up before," He, a 36-year-old local photographer, said while staring at the parched lake bed. 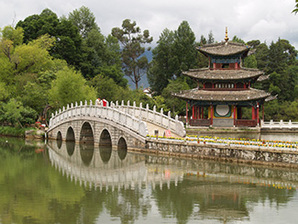 "It hasn't rained in Lijiang for a really long time." Lijiang is hardly alone. Similar situations are happening across other parts of Yunnan province, which usually has more rain than half of China's regions. But it has experienced extremely low rainfall for the past three years. In the first quarter of this year, Yunnan's average rainfall dropped by 70 percent, indicating the start of the drought's fourth consecutive year, according to the water resources department in the region. As national demand for Yunnan's hydroelectricity and other products keeps rising, the region is losing one of its most abundant resources -- water -- to produce them. The province is scrambling to adopt measures that would ease water stress, with mixed results. Meanwhile, its fast-growing population and economy are adding more water security problems. Four years of drought turned most of the lake into dry land. Photo by Coco Liu. Already, "when we look into the annual precipitation index we use, we can see that there has been no 'wet' month in Yunnan in the last four years," said Marco Gemmer, a senior adviser of the China Meteorological Administration in Beijing. "The length and intensity of the drought is larger than we have recorded in the past 60 years," he added. Gemmer attributes the record drought to changed atmospheric circulation, with less water transported in 2009 from the Gulf of Bengal, where Yunnan's rainfall is generated, being a prime example. Other reasons include a warmer climate than usual. "The atmosphere is a complex system, and small changes can have an effect at the other end of the globe," Gemmer explained. "Assuming that there will be further changes in the atmospheric system under global warming, we should be prepared for more unusual events in the future, which could also include extremely wet conditions causing floods or landslides." Meanwhile, Yunnan is losing an ally that once helped absorb such changes. To boost the local economy, the region has been replacing its natural forests with more commercial trees like eucalyptus plantings on a large scale. As bushes and other vegetation are cleared as part of that process, forests have a weakened ability to lock in rainwater, according to a study released this year by Greenpeace. In one county of Yunnan, the report notes, water reserves close to commercial forests dried up, while 30 miles away water was plentiful because natural surrounding forests remained uncut. So if Yunnan continues to replace its natural forests, Greenpeace warns, the region's forestry sector will no longer be able to conserve as much water when rainfall runs low. That's a thing Yang Zhikun definitely does not want to happen. Living in a village without modern infrastructure, Yang's family relies on springs for water, but because of the recent drought there has been no water flowing into his household tank for more than 20 days. Yang explained that he has to borrow water from distant neighbors. And if rain still doesn't come this month when the tobacco growing season begins, Yang faces a bigger challenge. In Yang's village of Longba, rainwater used to be sufficient to keep his mountaintop tobacco fields green. But since 2009, rain has gone missing, and Yang had to start carrying water up from a river several miles away. Last year, the amount of water needed for irrigation was so big that everyone in Yang's family went to help, including his teenage children and parents in their late 70s. Still, about a fifth of the tobacco seedlings he planted withered for lack of water. Replanting added more to the workload and the difficulties to make ends meet. "That was the hardest time in my life," the 40-year-old tobacco grower recalled. "I don't know how to make a living if the drought continues into this year." Yang is not alone. On the provincial level, the drought has already baked millions of acres of farmland over the past three years, leaving many farmers with nothing to harvest. The financial disaster has spread to businesses that trade and process agricultural goods. For instance, many rubber factories in Yunnan reportedly shut down due to insufficient raw materials. This, combined with declining revenue in other industries, has caused a direct economic loss of about $4.2 billion in Yunnan since the drought started in 2009, local media have reported. There is also a national impact. Yunnan is a major Chinese herb-growing area, and its falling output drove up herb prices nationwide. The drought has also hampered China's ability to transmit hydroelectricity from water-rich western regions to feed the country's power-hungry manufacturing sector, most of which is in the east. Meanwhile, the province's forests are on high alert because of the threat of wildfires. The drought has also dried up many lakes and wetlands, causing die-offs of aquatic species and forcing survivors to live in more polluted waters. In Fuxian Lake, a sharp water level drop has already shrunk the habitats of a type of fish that only exists there, said Duan Changqun, an ecologist at Yunnan University. He added that changes to one species will have a significant impact on the whole ecosystem. For now, no one knows what that impact will be. A complete analysis on the effects of Yunnan's drought is still missing, and some damage may not emerge for years. "Yunnan is known as Asia's water tower because many important domestic and international rivers start from here," Duan explained. "Droughts in Yunnan mean less water flows in the downstream, sending a blow to ecosystem of other parts of China as well as South Asian countries." Some steps have been taken in recent years to protect Yunnan's drought-stricken environment, such as strengthening fire prevention measures in forests. But Duan says those efforts are negligible compared with what is needed. "The priority is given to ensuring drinking water, and then supporting agricultural and industrial water use," he said. "Little water is left to help the nature." Yet even for residents, who enjoy the most support, getting water is becoming harder. Due to years-long intensive use and a lack of refilling, water levels in many reserves run low and cities like the provincial capital, Kunming, had to cut water supplies for households to four hours a day. Empty water reserves also made villagers hesitate to continue farming. In Longba village, the number of tobacco growers is decreasing. "Villagers believe they will not be able to get enough water for their fields, so why bother to plant?" explained Duan Shaokun, a local official. As one grower quits, then another and another, remaining growers begin to feel the pain of a smaller community -- tobacco companies are not willing to subsidize water-saving technologies and invest in more efficient irrigation systems because of the limited scale there, Duan Shaokun says. And villagers themselves can't afford the hefty upfront investment. So the government in Yunnan moved in to help. Through 2015, multibillion-dollar investment will be poured into constructing new water reserves of 3 billion cubic meters -- a nearly 30 percent increase in Yunnan's 2009 capacity. But experts say this may still not be enough. "Yunnan is facing a structural challenge," said Gemmer, the Meteorological Administration senior adviser. "The current development and economic structure cannot be maintained because it will be impossible to protect all 45 million citizens of Yunnan from droughts." The region's population already increased by 12 percent and economic output per capita quadrupled since 2000, but the available water resources per capita have dropped by half, Gemmer added. Yunnan has been trying hard in recent years to overhaul its resource-intensive economy and turn to industries that use less water, but now that plan is at risk. 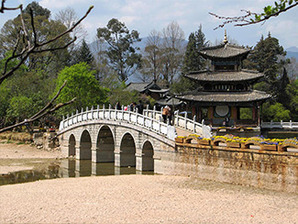 Lijiang, for one, has bet its economy restructure on tourism. In 2010, millions of travelers came to experience its beautiful lakes, gorges and snow-capped mountains, bringing revenue of more than $1.8 billion. But with a changing climate and persistent drought, that's gone, too. "I wouldn't have had time to talk with you at this time in previous years, but now I waited here for hours and saw only a few visitors," said He, the photographer who makes a living by taking pictures for tourists near Black Dragon Lake. Lijiang is now building a channel to bring in water from a nearby water reserve, but this can only refill part of the lake. Worst of all, global warming is causing glaciers, which supply most of Lijiang's water, to melt faster. According to a recent study by the Meteorological Administration, glaciers in Mount Jade Dragon began retreating in the 1980s, and more than 70 percent of glaciers there are expected to disappear if the average temperature rises more than 1.6 degrees Celsius from now to 2050. "Glaciers in Mount Jade Dragon are a lifeline for Lijiang," He said. "If they disappear, so will this city."